There are also pillows that can track when you’re the lightest stage of sleep so that they’ll start waking you with an alarm and softly glowing lights and you’ll wake up gently and refreshed, not startled. But all that is for another article. Today I’m telling you all about a pillow that is supposed to induce sleep – it is, in fact, a sleep robot. 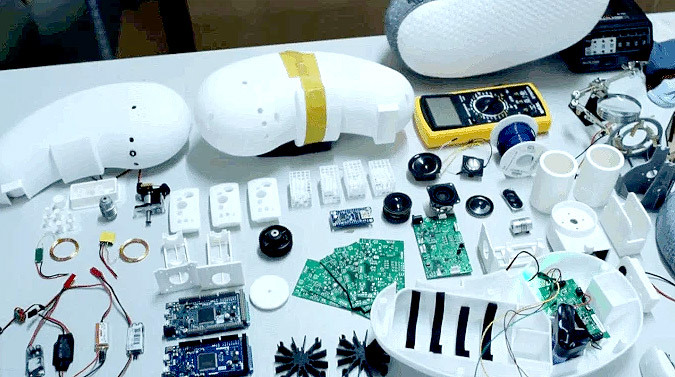 What on earth is a sleep robot? The Somnox is the world first sleep-inducing pillow, also known as a sleep robot. It is one of the latest most high-tech pillows on the market today, and test reviewers seem to love it. It’s actually not yet widely available commercially, but people who are interested are already ordering it from their crowdfunding page here or their website here, and the people behind the Somnox says it will be delivered by October 2018. Well, first of all, the Somnox is actually a peanut-shaped pillow that you hold in your arms as you sleep, not one that you put under your head. Apparently, when you hug the Somnox pillow in your sleep, you feel it “breathe” too, which means the pillow contracts and expands gently. And as it “breathes,” you adjust your breathing to its movements. The science behind it is that breathing is proved to naturally relieve stress and calm you down, therefore helping you sleep better. According to the manufacturers, the Somnox sleep robot is the “ultimate sleep companion that improves sleep by soothing body and mind, reducing stress and anxiety, so you can fall asleep faster, deeper and wake up feeling refreshed.” Strong claims indeed. The Somnox also comes with a variety of sounds designed to help you relax – from heartbeats to guided meditation to lullabies. Or, if you wish, you can even upload your own relaxing music. It turns off automatically when you sleep. The Somnox comes with an app that you can program for the sounds that you want to hear to help you get to sleep, and also with a timer, so that it will only do it’s “breathing” rhythms as long as you want it—whether that’s just a few minutes or all night long. It’s good for eight hours and then you have to charge it again the next day. It comes with an ultra soft and durable covering, and you can purchase an extra sleeve too if you want. Here’s a little backstory: One of the designers of the Somnox, Julian Martijn Jagtenberg, is a young robotics and engineering student from the University of Delfs. His mother suffered from insomnia. Instead of always buying medication, which he did not want her to get addicted to, he thought of creating a pillow that would help her sleep naturally. He and three other friends then partnered with Royal Auping, a well-known European mattress brand, to ensure that the pillow would be of really good quality. Judging from the Indiegogo page, a lot of people really like the idea behind the Somnox. It is one the most expensive pillows I’ve ever encountered, at € 499, with the regular price being €539. The extra sleeve alone is €49, but you can get it at a discounted price of €45. But it is now 200 percent funded! The young inventor was right in saying that a lot of people really do fight sleep problems these days. And, if people are unsatisfied with the purchase, the product has a 30-day return policy, so they can get their money back. However, the manufacturers claim that 90 percent of Somnox testers say they fell asleep quicker, while 70 percent reported better sleep quality. The pillow is constructed from soft polyurethane mattress foam. It has a nylon outer shell and an outer cover that can be washed. It does seem rather big and bulky, weighing more than 4 pounds (1.9 kg) and is 14 inches long, eight inches wide and 5 inches thick. It makes me wonder whether people can fall asleep with a pillow in their arms. I know I can, because I use a body pillow every night, and so I hug my sausage shaped one in my arms and slip it between my knees. As a side sleeper, this is the most comfortable position for me, and I’ve gotten used to it for more than twenty years, but would other people feel the same way? I was curious to find out how effective the Somnox is, and so I decided to read the reviews. 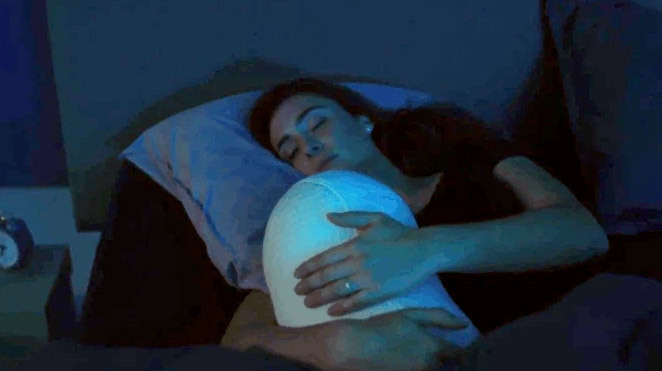 This pillow is considered to be so innovative that people are asking whether the designers have actually found a non-medical cure for insomnia. With as many as 1 out of 3 adults being sleep deprived, no wonder that the Somnox, even before it’s been distributed to regular users, has already been widely written about, with reviews in The Daily Mail, The Times, CNET, Digital Trends and other online publications. Many people seem to be quite excited about the Somnox. It cannot be denied that it is a definite innovation in the world of pillows after all. And an innovation that helps people get much-needed rest and sleep is always a good thing, right? Most reviewers seem pretty pleased with the science being the Somnox, pointing out that it really is a smart device that adjusts itself to everyone’s individual sleeping pattern. To be honest, it is impressive that the product’s website provides a scientific basis for the Somnox’s features, especially for the connection between breathing rhythm and sleep, as well as sound and sleep. They have a downloadable white paper here that discusses those features. So if you have questions about the product, they are quickly answered. To be honest, if I were going to spend between four hundred and five hundred euros for one pillow, I would ask a whole bunch of questions before actually making the purchase. It is a lot of money to spend on one pillow after all. Test sleeper reviews are pretty convincing as well. The reviewers are very enthusiastic about how refreshed they are when they wake up, and that they feel full of energy. Others wrote about how quickly they fell asleep with the Somnox, in as little as 15 minutes. There are also online video testimonies from test subjects, one of whom said that she slept deeper and better with the Somnox than she normally does, and this was even proven by her sleep tracker, the Fitbit that she wears when she sleeps. So far, so good. But what I’d really like to read about too is how someone struggling with insomnia or other sleep issues feel about the Somnox. One reviewer said that she did sleep pretty well with the Somnox, whose sounds reminded her of her boyfriend’s cat! This reviewer talked to some doctors who are sleep experts, who told her that they are not surprised that the pillow is effective, since deep breathing really does bring people to a state of relaxation, and therefore helps us sleep. These doctors actually teach their patients deep breathing exercises and advise them to practice these for ten minutes before sleeping at night. Learning to breathe deeply is definitely less expensive than paying almost five hundred euros for a pillow if you ask me. 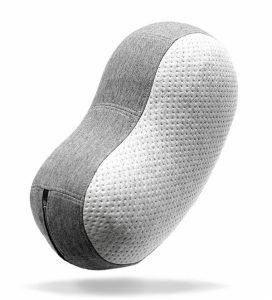 Here are my final thoughts about the Somnox Sleep-Inducing Pillow. Well, it certainly is innovative, I’ll admit to that. Plus, I really like the backstory of it all, that a son cared so deeply about his mom’s insomnia that he designed a non-invasive sleep aid for her, and for people who have the same issues. I’m a softie for that kind of thing. 10 claps for Julian Jagtenberg, whose voice, by the way, comes recorded in the Somnox’s programming to wish you goodnight in Dutch. But the price. Oh my, I kind of stumbled over it. As sleep deprived as I am, I don’t quite know if I’m ready to pay that much for one pillow. Maybe one day I will be. But until then, every spare penny I have goes into my travel fund, because there’s a great big world out there to see! In a couple of years my boyfriend and I are going exploring in New Zealand, so I and definitely saving up for that. Speaking of traveling, check out what I wrote about the best travel pillows here. 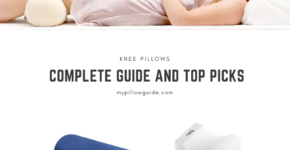 Let me save you some time and money you may spend on looking for the best travel pillow, just pick the one that suits you best from my guide. What about you? Would you spend (almost) five hundred euros on a robot pillow that promises to help you sleep? Do you think it’s worth it? Let me know in the comments below.